Yet another postcard of a tram at Billinge End. This time it's a single deck one. I'll bet it was nice on a summer morning, slowly trundling down Preston New Rd into town on one of these. Hi Colin, I know that geography isn't my strong point !! But I'm struggling to place this location. If the chap is stood on the corner of Revidge Rd, then wouldn't Billinge End Rd be directly across from it ? The same could be said if the Tram is travelling up Preston New Rd from the Preston end of it. Also the junction would be at a cross roads. I'm sure you will put me right on this without using Google eh !! Hi John - I think it's another of those old postcards that has been hand coloured and they've used a bit of artistic licence in the process. If you look at one of the other ''Billinge End'' postings (there's only the 3 so far), you can see the gate to that house behind the chap. In the other photo, a woman has just walked by it and is heading up Revidge Rd. You can also see that triangular structure, above the gate (or is it a little hut?) at the other side of the road (sort of on the corner of P. N. Rd and Billinge End Road). It is the crossroads at that point, they've somehow obscured the opening of Billinge End Rd during the colouring process. I've seen the gable of the house on the corner of Revidge and P. N. Rd in quite a few old photos. That property was demolished a long time ago and a huge red brick house now stands on that corner plot, with it's gable facing P. N. Rd (My younger brother, the builder, has worked on it a few times. It's definitely that crossroads. Like I say, they've just used a bit of artistic licence. That hut thing with the triangular top on the left of the photo John, was either a telephone kiosk or a policeman's rest place (the former I think - I can't remember off the top of my head). There's a close up of it in various ''old Blackburn'' books. Have a look through your books, you might have it somewhere. From memory, I think in the photos of it, it's painted white and has a log cabin look or giant basket weave effect to the outer walls. 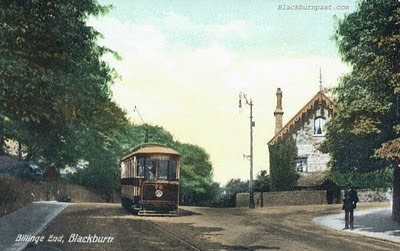 John, have a look at photos 38 and 39 in that ''Blackburn in old picture postcards book'' It has the B&W image of the above card, plus a postcard looking from Billinge End Rd up Revidge Rd and you can see the ivy covered house on the corner in both shots. I've had a look at the book of "Blackburn in old postcards" as you suggested, but the print seems to be an exact copy of the photo, so I'm still confused as the other photo with the two women in it clearly shows Billinge End Rd directly opposite that big street lamp. HELP !! Not much I can add to help you there John. It's the crossroads where the traffic lights are now and it's looking in the Preston direction. Over the brow of the hill, behind the tram, is where the Woodland's pub is. If you look at the second 'i' in the word Billinge, then look above it at the wall, there's a little white spot and some daylight spreading across the pavement. Well between the white spot and the triangular structure (on the same side of Preston New Rd) would be the opening of Billinge End Rd. Like I say, with the ''artist'' touching it up, they've sort of obliterated the road end to a large degree, but it is supposed to be there, as I think that's why the daylight is spreading across the pavement. That wall on the left possibly isn't the wall that's there today. Things alter over the decades. By the way, the triangular cabin on the left (corner of P. N. Rd and Billinge End Rd almost) was an early telephone kiosk. I looked it up. By the way, the destination of the Tram reads "Station Only"
I've always believed the small building that still resides on the corner was a police building...it looks to be a little bit Art Deco - it's tiny, but quite neat! That one was a police outpost Lorcan. Even in my time (1960's / 70's) it was used to some degree by the police. The telephone kiosk/cabin I mention above, with the triangular top, was a wooden structure and stood on the opposite side of the Billinge End Rd junction, facing the ivy covered house in the above photo.